Last night I visited Market Restaurant located in the historic Mordecai neighborhood near downtown Raleigh. My friend Marianne and I had tweeted the owner, Chef Chad McIntyre, to let him know when we would be stopping by. Chef Chad is on top of the restaurant’s Twitter account. Within seconds, he made us reservations and couldn’t wait for us to join them for dinner. He even tweeted me back once when his wife was going into labor; talk about dedication! When Marianne and I arrived at Market Restaurant, I immediately noticed the outdoor seating. The patio was quaint, and fresh herbs were growing outside. Market Restaurant is committed to serving a seasonal menu with whole, all-natural, unprocessed foods from local farmers. Not only do they grow their own herbs, but they also have a beehive as well. The honey from their hive is used in a local beer and other dishes offered at the restaurant. 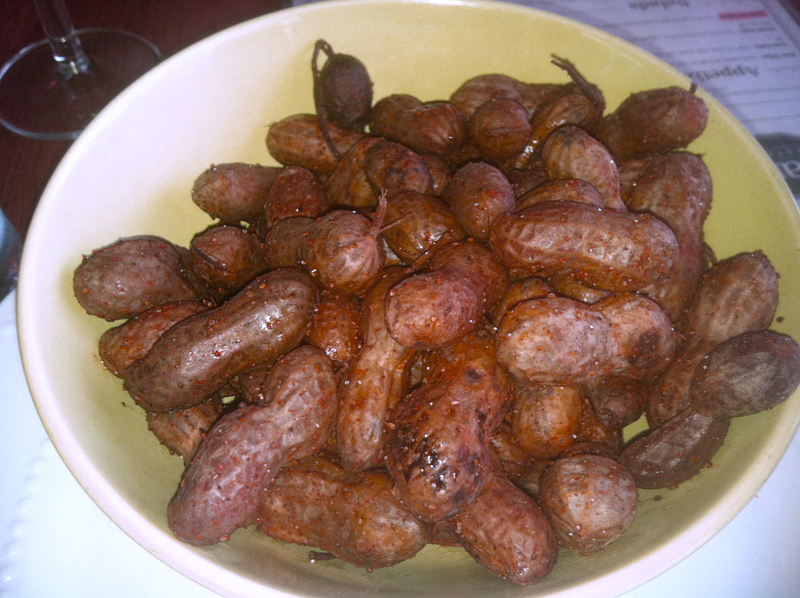 For an appetizer, Chef Chad brought me and Marianne a bowl filled with Cajun and crab boiled peanuts. The peanuts were boiled for over two hours and topped with Old Bay seasoning. Talk about delicious and unique! The appetizer reminded me of trips to the beach with my dad; we always stopped at a roadside stand to get a brown bag filled with boiled peanuts. I’ve been to the Market Restaurant a few more times in the past, and I highly suggest the Crack Fries as an appetizer as well. The fries are hand-cut and topped with asiago cheese, truffle oil, herbs and green onions. No wonder everyone is addicted to these fries, the toppings are phenomenal! They are also served with house-made ketchup and garlic aioli. After debating over the entrees for 15 minutes, Marianne and I finally placed our order. The menu has so many great options and is wonderful if you have special dietary needs. The menu is labeled with options for vegans, vegetarians and those who are gluten-free and ovo-free. 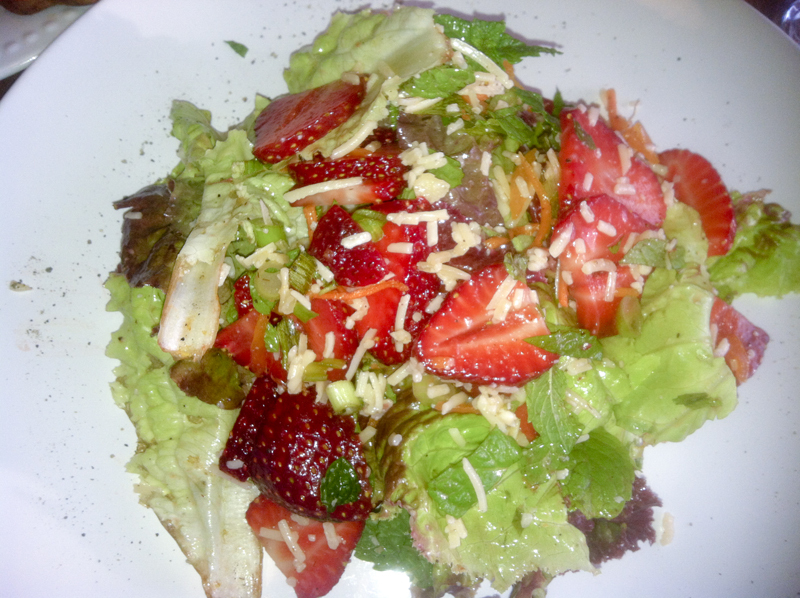 I decided on the Strawberry Mint salad, mixed greens with fresh N.C. strawberries, mint, pickled onions and pickled carrots tossed with house-made honey vinaigrette. The salad is a finalist for the Best Dish in N.C. challenge, and no wonder! The fresh mint and strawberries paired together create an incredible flavor. If you’re looking for creative, farm-to-fork food options in Raleigh, Market Restaurant is ideal. Chef Chad and his crew are dedicated to creating one-of-a-kind, fresh foods ranging from shrimp and chorizo to vegan summer lasagna. Pay Market Restaurant a visit… you won’t be disappointed!